This sounds wonderful! Asparagus is one of my favorites too! I cook broccoli this way. I don't know why I didn't ever think to cook asparagus that way too. Thanks. our favorite is roasted or grilled too. I just love it! Wow! I've never thought to cook it this way. I'm lame, I know. We usually just do the steam thing (and then I commit probably the worst sin by eating it with a little mayo on the side). I need to give your way a try for sure! 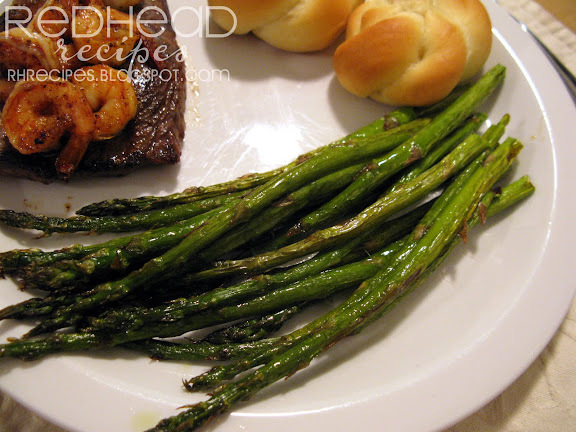 I love roasted asparagus! Simple and easy to make but they taste so good! I've started to roast all my vegetables too. I find that the vegetable retains more flavour that way. I just did it with mushrooms.